Take your flight to Beijing and arrive at the Beijing Capital Int’l Airport, to be welcomed by our English-speaking representative, for your smooth transfer to the hotel and check in. Relax in the hotel in the evening or take a stroll around the lane. A warm Indian dinner awaits you later in the evening after which you can relax to be prepared for the next day. After breakfast at hotel, proceed to visit various iconic destinations of Beijing including the Summer Palace, the largest and best preserved of all the imperial palace gardens, and delights as the “Marble Boat” and the ornately painted” Long Corridor” Pearl shop. Visit the world famous Tiananmen Square the biggest square in the world that lies in the center of the city and the Forbidden City where the intriguing pasts of the Emperors of the Ming and Qing dynasties awaits you. You also have the options of visiting either Houhai famous for its nightlife or the Kongfu show in the evening. After breakfast at hotel, proceed to city tour, visit the fabled Great Wall-Juyong Pass, a UNESCO World Heritage Site and a massive defensive structure built to keep off intrusion. Visit a Longdi Jade shop where we will learn about Chinese jade culture. In the afternoon proceed to see the Bird’s Nest (Olympic National Stadium outside) and the Water Cube (Outside). You can also enjoy some fun shopping at Xiushui market. After breakfast at the hotel, proceed to the city tour. Visit various attractions of Shanghai like the Shanghai Museum, People Square and Nanjing Road for shopping, the Silk Museum and the Yuyuan Garden-outside look nine zig zag bridge with golden fish pond, bridges and pavilions. 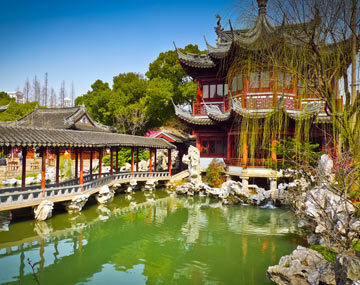 You will also be shown several temples and sacred places of Shanghai to experience the serenity of the place. In the evening you have an option of enjoying the Huangpu River Cruise. Breakfast at hotel, with a transfer to the airport for your flight back to India. Being China’s famous capital city, Beijing is one of the must visit destinations for every visitor to China. The city known for its modern architecture and intriguing structures, wins over every traveler making them crave more of the city. Be it the religious and spiritual side or the exciting nightlife, Beijing is one of the most ancient cities of China, that is known as the city with a heart and a soul. Shanghai on the other hand is one of the biggest cities and a global financial hot spot of China. The city is not only visited by business traveler but also by tourists as it has multiple fun and to do options. Beautifully developed with sound infrastructure, the city of Shanghai offers multiple sightseeing, shopping and food options for that complete vacation experience in the city. All in all, a visit to Beijing and Shanghai together, is like exploring the essence and the heart of China. While both Beijing and Shanghai are extremely tourist friendly places, booking a holiday package to the tow destinations can help you overcome a number of hassles including booking, reservations, local travel and so on. The cities are both highly diverse and being an Indian, language could be an issue for you if you are traveling alone. Hence, the best option is to go with a carefully tailored tour package which will help you cover the cities entirely. Rate applicable for 3rd Pax in Triple room will be same as Twin sharing Pax. Personal expenses like phone calls, laundry etc. shall be borne by the guest on actuals. Visa processing fees + insurance is not a part of the package cost. In the case of Hotel room unavailability in a mentioned hotel, an alternate hotel will be provided.